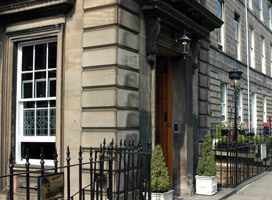 The 3* Royal Scots Club is housed in an historic Georgian building, located within walking distance of the city centre. Located in the New Town area the hotel is 18 minutes walk from The Royal Mile which is the heart of historic Edinburgh, linking Edinburgh Castle and the Palace of Holyrood. Whilst strolling between these two great landmarks visitors can also make a stop at the Museum of Edinburgh which charts the cities fascinating history. The hotel is also just a 10 minute stroll to the bustling Princes Street with its fantastic shops, restaurants and bars. More Info. Family rooms: Upto 2 children under 12 can be accommodated in a Family Room sharing with 2 adults.